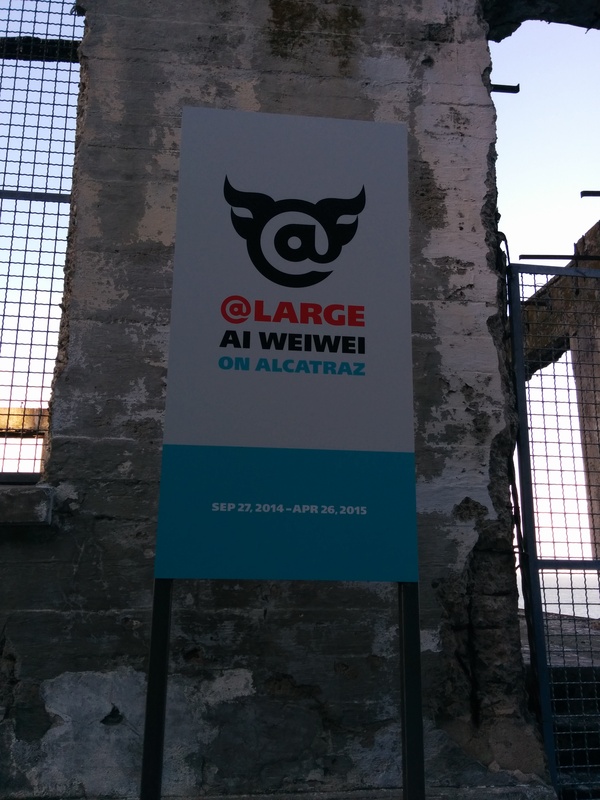 A compelling paradox lies at the heart of @Large, conceived by the internationally renowned Chinese artist-activist Ai Weiwei: while under house arrest in his home country, he has imagined and created a monumental installation in the United States. A pointed look at human rights, repression and freedom, this new work is neither located in a commercial art gallery nor in a museum but instead strategically placed on Alcatraz Island, a site whose charged history conjures images of imprisonment and political activism. A similar tension appears in the work of ODC/Dance, whose moving installation Speaking Volumes unfolded during @Large’s opening night on September 26. While the dancing body is the paramount expression of human freedom, it was subjugated to multiple restrictions and constraints during the evening performance, exploring the issues of censorship and resilience present in Ai’s work. Way looked at a large number of Ai’s works and was struck by “the way that he is known with words,” she recalls. “So the idea of consuming or hiding the words of marginalized people has been an important image. You watch words disappear over the course of the piece in several ways,” the choreographer explained. In the opening act of ODC/Dance’s moving installation, viewers were greeted by a majestic 12-foot figure –dancer Yayoi Kambara- whose white gown appeared endless and whose languid torso and curving arms glistened in the late afternoon autumn light. 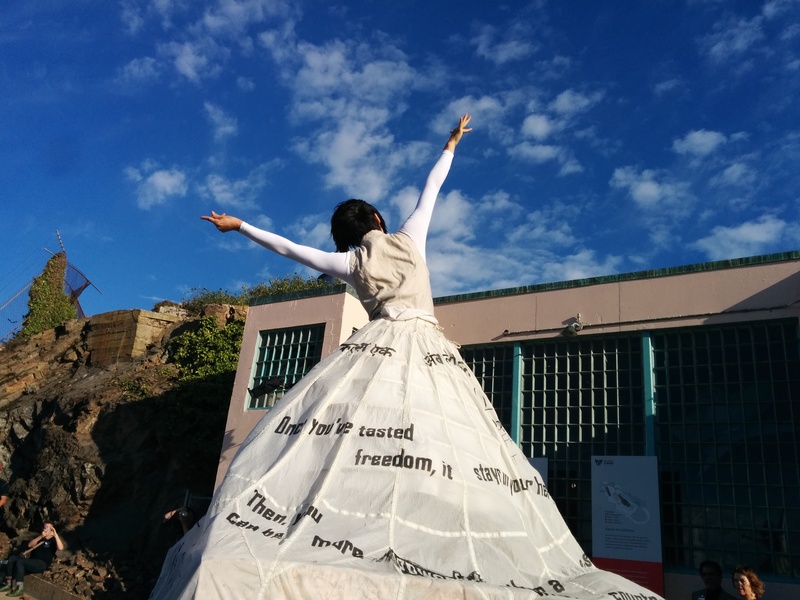 The skirt bore the written inscriptions of some of Ai’s statements in different languages. While Kambara arched and stretched her upper body, her lower half appeared stuck to her pedestal. The image poignantly echoed Ai’s Refraction piece, which lay silent in the adjacent New Industries Building. An earthbound wing made of a collection of reflective panels and cooking utensils used in Tibet, Refraction weighs 5 tons and is only viewable from thick and often damaged windows that populate the walkway formerly used by guards to watch over prisoners. Literally encased in its showing room, the monumental object resembled a strangely surreal animal suffocating in its enclosed environment. Kambara seemed to give wings to Ai’s entrapped work, but as the audience left the building, a mannequin had replaced her, and the writing had been erased; “A suggestion that people are censoring or obliterating the insights we are trying to share, as artists or activists,” Way commented. The image of the bird was repeated throughout the piece. Dressed in bright red leotards, dancers Josie Sadan and Anne Zivolich performed fast-paced solos with fluttering hands, evoking hummingbirds rendered frantic by entrapment. The sense of being caged in was brought to its paroxysm as dancer Dennis Adams encircled Zivolich and proceeded to bind her torso and legs with tape. She fiercely kept on darting in all directions, until her motions became restricted to the point of being unable to move at all. Adams then picked her up and carried her away, slung over his shoulder like a log. The literal and symbolic images of binding wove throughout the dance installation. At one moment, Kambara reached out to an end of the red cloth covering the length of the hallway. Wrapping herself with it, she first appeared queen-like with an avenue of ruby red draping behind her, until she bent down and began rolling inside the drape, along the 177-feet length of the hallway. The fabric slowly constricted her and hid her head and feet, so much that she became a formless lump of red mass at the end of the roll. Motionless, she was picked up by two performers, recalling anonymous dead bodies carried away. The theme of restriction carried to the audience, which at times would be involuntary ‘caught,’ and its path interrupted, by a group of dancers running with the frenzy of trapped animals. The installation was conceived so that viewers walked through, rather than stood and watched from afar. “Normally you look at art from a distance. I think [Ai Weiwei] is trying to have you walk in his art, through it. And I think that’s what we are doing too. We surround you,” explained Nelson. This idea of involving the viewer recalled Ai’s call for “people to be ‘obsessed citizens,’ forever questioning and asking for accountability.” By walking a foot close to a bound body, what do you feel? How do you react? What are you propelled to do? were questions raised by the choreography setting and content of the piece. In an interview aired on KQED last week, Ai had mentioned that because of the site’s constraints, he couldn’t “touch anything, add anything” and had therefore conceived his exhibition like a “hanging installation” which, not unlike prisoners, was meant to be there for a limited amount of time. Similarly, viewers and performers came and went on September 26. Yet the dancers’ movements imprinted the landscape, casting light on the inherent resilience of the human spirit, and spreading seeds of change. In the past few years, artists have increasingly taken on a curatorial role. 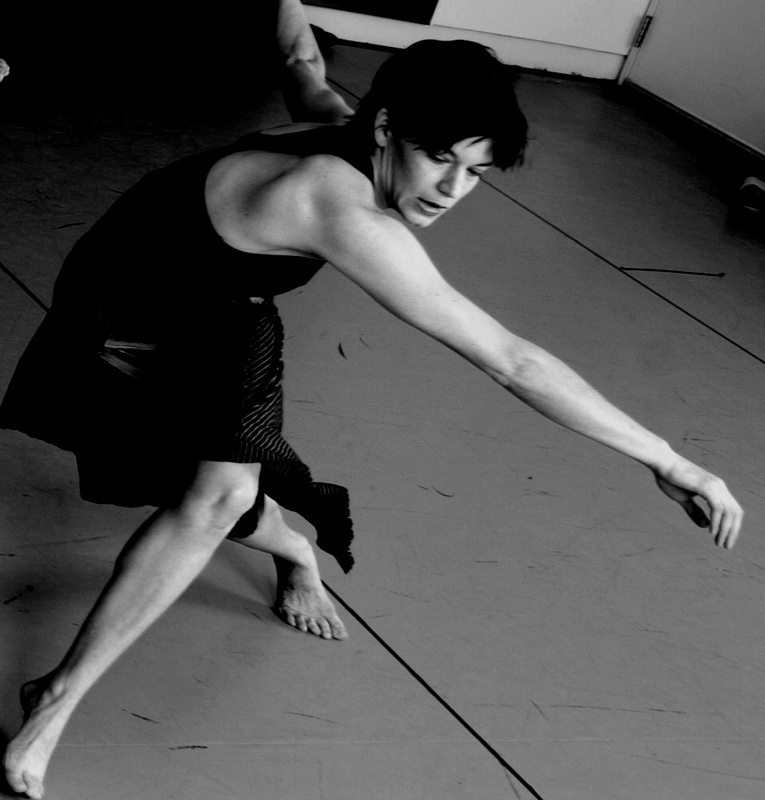 In New York, Danspace Project’s PLATFORM series comprises programs curated by guest artists. 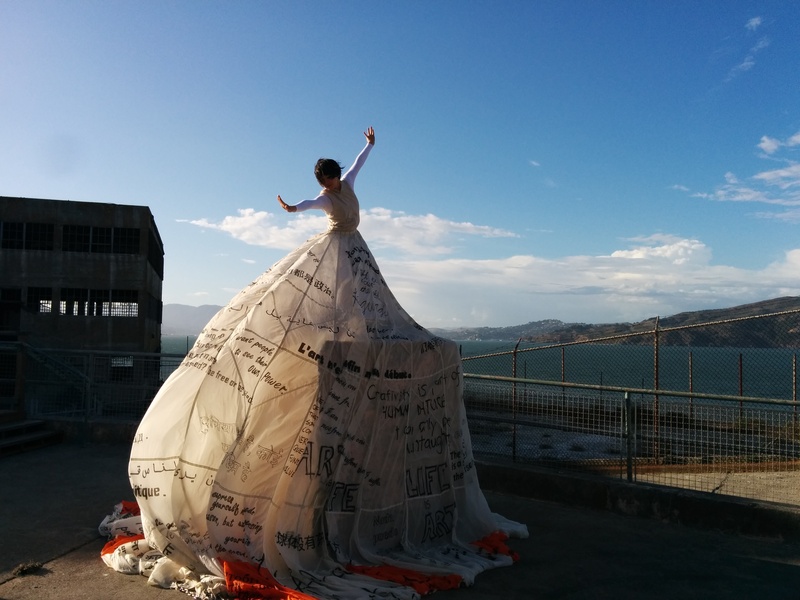 In the Bay Area, many choreographers have stepped into this position, including Amy Seiwert with the Sketch series, RAW Dance with the Concept series and Hope Mohr with the Bridge Project. As curators, artists facilitate conversations, build community and initiate trends. How is this recent surge of the ‘artist-curator’ transforming the dance field? What questions and challenges do the curatorial choices of these artists raise? While addressing these questions in a post-show panel discussion, this year’s edition of the Bridge Project focuses on the West Coast lineage of the Judson Dance Theater. Operating between 1962 and 1964 through a series of performances at the Judson Church in New York, the Judson Dance Theater impacted the dance scene to this day, by breaking with the conventions of modern dance, incorporating everyday movement into choreography, and blurring the lines between art and life. 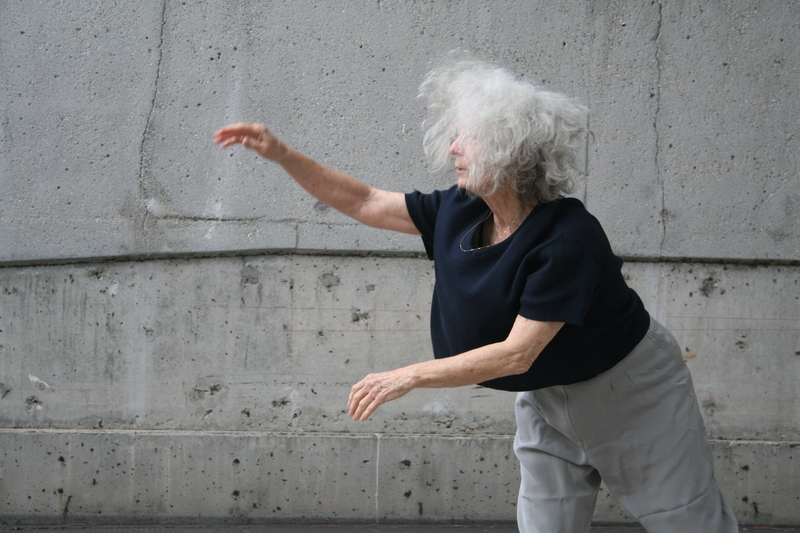 This year’s Bridge Project features solos performed by four women and dance artists: Anna Halprin, who taught many leading figures of the Judson Dance Theater, including Trisha Brown and Yvonne Rainer; Simone Forti, who studied with Halprin before moving to New York and joining the postmodern movement; Mohr, who performed in the companies of three members of the Judson Dance Theater (Trisha Brown, Lucinda Childs, and Douglas Dunn); and Peiling Kao who performs a new solo choreographed by Mohr. Mohr and I recently met to discuss the program and her curatorial agenda. Marie Tollon: In the past, the Bridge Project has featured your work in conversation with another artist’s work. The format is slightly different this year. Hope Mohr: I’ve gotten to the point where I want a whole evening dedicated to my work. I also want the Bridge Project to have its own separate platform. So I split up the programs into a fall program with a curatorial focus and a spring program dedicated to my work. I still have a new piece on the program this fall, but the program is more focused on curatorial thinking. MT: You have mentioned that the Bridge Project is also a way to present artists who are under the radar or whose work has not been presented in the Bay Area. But this year’s artists -Simone Forti, Lucinda Childs, Anna Halprin- are certainly not underrepresented. What was your incentive for bringing them together? HM: The 50th Anniversary of Judson was two years ago. They had a big Judson celebration in New York at Movement Research, but the West Coast aspect of that lineage has not been given sufficient attention. In that sense, the Bridge Project continues to address underrepresented areas of critical thinking in dance. MT: The program showcases four women and dance artists of different generations, thereby raising questions about age and lineage. Can you talk more about that? HM: I wanted to curate a program that framed content in terms of lineage. 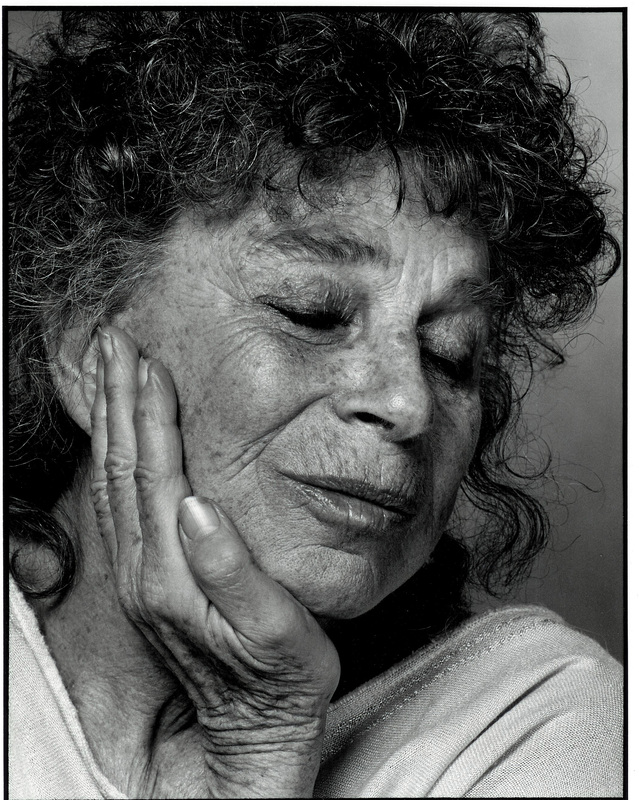 Anna Halprin is the grandmother of Judson in many ways. Yvonne Rainer, Trisha Brown, and Simone Forti all studied with her before going to New York and developing many of her ideas –task based movement and improvisational approaches to choreography in particular. Of course Judson was not all connected to Halprin, but I think she deserves recognition for her role in that wave of radical experimentation. So I wanted to represent Halprin as part of the Judson lineage. I also wanted to include Simone Forti, who was involved in the New York avant-garde of the 1960s and has also been a West Coast voice for quite some time. Forti links Halprin, Judson and the West Coast. Lucinda Childs [Mohr is performing Childs’ 1964 solo Carnation on the program] is definitely an East Coast voice, but I danced for her and I brought some of her sensibility into my own work, namely a concern for formal composition, so now part of her sensibility lives here through me. Finally, I wanted to make a work for the program that represented my ongoing efforts at weaving all these strands –the formal, the experimental, and the personal as source material. MT: The evening consists of four solos. I imagine there are some practical reasons behind this choice, but I wonder if there are also conceptual or aesthetic incentives for choosing the solo form? HM: Indeed it was logistically more feasible to present solos rather than ensemble pieces. But the solo form also distills choreographic voice. And I’m hoping that the commonality of the solo form will bridge the works in a way that creates a conversation among them. MT: One of the post-show talks is dedicated to curatorial thinking. As you wrote on your blog, “ ‘Curate’ has become one of the defining buzzwords of contemporary culture. Contextualizing one’s art has become almost as important as making it.” How do you feel curatorial thinking is affecting the dance field and the dance discourse? HM: The democratization of curating is emblematic of our culture of networking and networks. More than ever, people are conscious of their position in a web of artistic relationships. Contemporary influence is not only linear. People are not only influenced by historical icons; they are also deeply influenced by their colleagues. The rise of curatorial activity also goes hand in hand with the rise of collaboration as the dominant mode of making. Now people think about their work in relationship to other people. The model of the lone modern master is dead. MT: You have mentioned that this new role of artists as curators raises important questions. HM: Yes. What are the values driving our curating? Are we trying to elevate our own work by associating ourselves with people we think are great? Are we trying to surround ourselves with people who are like-minded? Are we trying to sell more tickets? Is it purely economics? There are a lot of different ways to curate. Are you trying to start a conversation? Are you allowing yourself to be influenced by the work? What is the process of creative cross-pollination? Curating raises questions not just for artists, but also for audiences. Is curatorial activity for the audience or is it for the artists? MT: Paul Taylor announced last spring the creation of Paul Taylor’s American Modern Dance, a center that will present his works as well as dances from modern dance pioneers and contemporary choreographers. Similarly, Stephen Petronio announced the creation of Bloodlines. It is not only a way for these choreographers to maintain some iconic work alive, it is also putting their work within context. How do you see this fairly recent need for contextualization in the dance field? HM: I think it’s important not to operate in a vacuum. I think it’s important to recognize what’s in our creative DNA. Just as it is important to go to the Met and look at Cézanne, it’s important to continue to see a Lucinda Child’s piece made in 1964. It gives contemporary artistic practice context. Defining our relationship to influence is related to the articulation of our voice. MT: In addition to your dance making practice, you write. The dialogue between writing and choreographing permeates s(oft is)hard, which you previewed at Take 5 as the result of a process of transferring thirty years of journals onto the moving body. What elements were you hoping to retain in the process of translating content from the static, somehow virgin vessel of the page, to the living vessel of the body? HM: There is a raw intensity in my younger journals. Originally the solo embodied only that quality. It was very hard to watch. It was too unrelenting. So I worked with Peiling to find a range of qualities. Now the solo holds some shards of that intensity but also some softness, which makes it easier for her to perform and easier to watch. The process of moving from hard intensity to softness echoes my experience of ageing. When I was younger I experienced anger as my primary means of female power. I’ve discovered, or I’m trying to discover, softness as a kind of power too. Making the solo has been an exploration of the possibility that softness can be powerful. MT: Journaling is an intimate practice in which the writing is meant to remain undisclosed. Would you say that your improvisation practice is akin to choreographing journaling? HM: Yes. I journaled as a way of hearing and finding my voice. S(oft is)hard continues my interest in writing as part of choreographic thinking. Starting at age nine, I kept a journal to hear my own voice. Journaling is a form of repetition, but also change: at some point, I no longer needed it. My last journal dates to 2000, when I landed my first contract with a professional dance company. As I birthed a public identity as an artist, a private writing self became less necessary. The process of making s(oft is)hard involved sifting through 89 journals spanning twenty years. I kept the first and last, but the rest went into the recycling bin. For me creative practice now takes the form of improvisation in the studio. I do still write, although now it’s for my blog, which is not private. Blogging is the new journaling, for better or worse. MT: Can you talk about the sound score? HM: The score consists of a series of dates. The first date is my mom’s birthday. Journaling has been more of a medium for women than for men, due to the traditional relegation of women to the private sphere. Virginia Woolf wrote that “as women, we think back through our mothers.” Even though I didn’t start journaling until 1980, my writing lineage goes back at least to my mother, who is also a writer. That’s why the dates in the sound score start with her. This program is about the passage of time. In making s(oft is)hard, I was thinking about the passage of time as it imprints on the body. 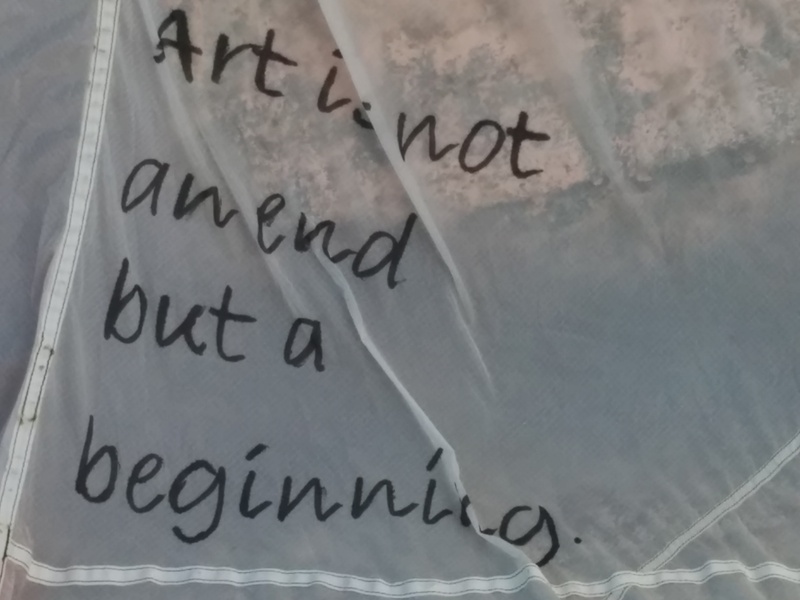 I was also thinking about how, in the practice of journaling, entries are a series of windows in time. Underneath that series of dates there is the ongoingness of the body. While journals mark time through dates, the body continues to move and age. HM: The postmodern aesthetic is not monolithic. This program does not claim to represent all stories, all trajectories nor all lineages. It is simply my personal window into the question of lineage. Even with respect to my personal artistic lineage, there are many more people who could also have been on the program -Trisha Brown, for example. Finally, a central inspiration for me in curating the program has been Brian Eno’s idea that good work doesn’t come from solitary genius, but from an ecology of ideas. The program offers one ecology of ideas that I hope will in turn feed back into the larger ecology that is dance making in the Bay Area. Talking to Summer Intensive students at ODC last August, dance scholar Janice Ross shared how her interest in engaging with dance intellectually led her to pursue the then budding field of dance studies. Ross invited students to reflect on what dance studies are, while insisting on the role they can play beyond the academy, in the world. Below is an edited version of Ross’ presentation. When I graduated from UC Berkeley in the early seventies, the only path into dance outside of the studio was to be a dance critic. That was what I did for the first 10 years. I wanted to write and engage with dance, critically, intellectually, the way that our historians wrote about art. And it wasn’t a widespread practice in dance then. I did that for 10 years, loved it and found that I wanted to go deeper. It was well-timed because this field called dance history was beginning to enter the academy and it was the beginnings of the possibility of doing graduate degrees in dance, to do something other than being a studio teacher or in addition to. And so I pursued that. I did a Master’s and then a PhD. All my colleagues, my peers, were also stepping out of criticism into dance scholarship – people you may know: Sally Banes who is a really important dance writer for the Judson postmodern movement, Joan Acocella who is a critic for the New Yorker. And we all moved laterally from criticism into a different kind of dance scholarship, or some of us kept a job in two. And I ended up at Stanford, which was great timing for me to help build a dance academic component to the dance studio classes there. And now I write books instead of dance criticism and I get to go really deep. I have three questions I’d like to pose: What is dance studies? Why does it matter? What does it do in the world? The way I think about it is that it is a way of holding up dance for an investigation of what dance does in the world. I am linking that investigation to some kind of practical outcome. I am looking at ballet in Soviet Russia because I believe it was an extreme form of resistance to a totalitarian state. That’s a pretty risky claim and you have to justify that. As I am an historian at heart, I will footnote some history. Dance entered the academy initially as a form of physical wellbeing, at the turn of the century, for American women. It was a way to make them physically more robust. There was no dance theory, there was no dance analysis. Dance was not about performing, it was about feeling, not showing. It was not an intellectual practice, it was a physical practice and it started at the University of Wisconsin with a woman named Martha H’Doubler in 1917. It was about sensation, it was not about display and all these kinds of divides have been bridged now by the practice of dance in private studios and in the academy. So we had to live through decades of this slow reclaiming of dance from all the things that were deliberately cut off from it. Dance studies allowed me to go back and write that story I just told you. I did my PhD at Stanford in the School of Education and I thought that the first dance studies book I would be reading was going to be the story of how dance ended up at the university. And there was nothing on it! There were untouched archives at Madison, Wisconsin, but there was no story written. For me, that was writing the history I wanted to read. And then I was launched. When you start researching and writing, you are making meaning out of pieces, you are expressing to an unknown audience this understanding about dance. You are letting it peek inside of it. That’s the first big question and that’s a definition that’s not clear, there is no closure on it. Initially, when Christy invited me to come here, she asked me if I would talk about the Mellon Dance Studies Seminar that just convened at Stanford last month and that is part of a nationwide effort to further define dance studies. I do it with two colleagues, Susan Manning at Northwestern and Rebecca Schneider at Brown. And we rotate throughout our campus every summer, holding an immersive 7-day institute, 10 hours a day, of what dance studies is. What does it look like? Where is it happening? We accept 24 people, all expenses paid, room and board, young scholars who live at Stanford or Brown or Northwestern and just saturate themselves with questions. That’s one of the first attempts to create an institute in the summer around this subject. What do dance studies matter? It provides the cultural surrounding for the moment for the dance as it’s unfolding and that’s very critical. That sometimes gets lost in criticism and dance studies try to add it back. The scholars who look at the dance reviews also look at the ads on the page next to the review, they try to get that moment. As a scholar, the more we can show that dance is about race, class, gender, that it actually operates at the heart of some of the most problematic areas in society, the more legitimized it is for an area of research in the academy. What do dance studies do in the world? It is accessing information that is not retrievable or demonstrable in any other way. There is a unique province of expression for dance, for the moving body. It occupies a place that if it were to vanish, we would lose a full series of knowledge and conversations. It’s getting cannibalized by other humanities disciplines –at least where I live- because they are very interested about what you can read on the body. How do you read a body that doesn’t say any text, that’s moving? And we know that, we live in that. But to make it explicit is incredibly valuable. The more mediated our lives become, the more critical the live moment is. How do we really grab and present liveness is a huge issue. Janice Ross is a professor in the Theatre and Performance Studies Department, Faculty Director of ITALIC, Immersion In The Arts Living In Culture freshman residential program and former Director of the Dance Division at Stanford University. She has a BA with Honors from UC Berkeley and MA and PhD degrees from Stanford. Her most recent book, Like a Bomb Going Off: Leonid Yakobson and Ballet as Resistance in Soviet Russia, is forthcoming from Yale University Press in January 2015. She is the author of three other books including Anna Halprin: Experience as Dance, (University of California Press 2007), winner of a de la Torre Bueno Award 2008 Special Citation, San Francisco Ballet at 75 (Chronicle Books 2007) and Moving Lessons: The Beginning of Dance in American Education, (University of Wisconsin 2001). Her essays on dance have been published in several anthologies including Dignity in Motion: Dance, Human Rights and Social Justice, edited by Naomi Jackson (Scarecrow Press 2008), Perspectives on Israeli and Jewish Dance, ed. Judith Brin Ingber, (Wayne State University Press, 2008), for The San Francisco Tape Music Center: 1960s Counter-culture and the Avant-Garde, Performance and Ritual, edited by Mark Franco (Routledge 2007), Everything Was Possible (Re) Inventing Dance in the 1960s, edited by Sally Banes (University of Wisconsin Press 2003), “Improvisation as Child’s Play,” in Caught by Surprise: Essays on Art and Improvisation, edited by Ann Cooper Albright and David Gere (Wesleyan University press 2003). Her awards include a Guggenheim Fellowship, a 2010-2011 Fulbright Fellowship to Israel, two Stanford Humanities Center Fellowships, Jacobs’ Pillow Research Fellowship, as well as research grants from the Iris Litt Fund of the Clayman Institute for Research on Women and Gender, the Memorial Foundation for Jewish Culture and the Djerassi Resident Artists Program. For ten years she was the staff dance critic for The Oakland Tribune and for twenty years a contributing editor to Dance Magazine. 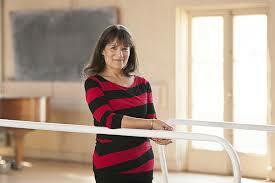 Her articles on dance have appeared in numerous publications including The New York Times and The Los Angeles Times. She is past President of the international Society of Dance History Scholars and past President of the Dance Critics Association as well as a former delegate to the American Council of Learned Societies. In the past few years, the social, economic and demographic landscape of San Francisco has shifted considerably, due primarily to the recent tech boom. How are dancers adjusting to this change? What alternatives are they finding to pursue their work? Freelance dancers Irene Hsiao, Eric Garcia and Katherine Wells have each found a way to sustain their artistic practice in the Bay Area. ODC Deputy Director for Advancement Christy Bolingbroke interviewed them as part of ODC Next Moves’ lecture series. Christy Bolingbroke: To start off, did you go to college and what is the most important lesson you learned from that experience? Irene Hsiao: I did go to college. I studied English literature and molecular cell biology, with a concentration in neuroscience. I learned how to dance in college. Katherine Wells: I did not go to college; I actually finished high school early. I started cutting classes more and more so I could jump on the train and take [dance] classes. I remember one of my teachers wrote on one of my papers: “You are one sprained ankle away from working at McDonald” and that was the last time I went back to class. I felt I was done with high school and was going to pursue dance. I got my first freelance job right around that time, when I was 16, in the Bay Area. Eric Garcia: I went to USF, to study performing arts and social justice. I started dancing in college, as most men dancers do. The dance department at USF is focused heavily on community-based arts, it’s less about the technique and more about the communities you work with, how to be a choreographer, how to be a director. I learned how to identify and to use resources, so that you can do what you want to do. CB: One of the biggest challenge in coming out of a very structured or codified program like a college or the dance school you grew up with, is to make time for class when you are also trying to make time to create the work. Can you tell us about your regular practice, what kind of classes you make the time for? IH: For me, at this stage, it’s more about trying to absorb more information, so I try not to have a too regular schedule, because I want to experience things in a new and different way. KW: I mix some ballet and modern. With age, cross training is more and more important to prevent injuries. Early on in my freelance career in the city, whenever I was not working with someone who provided class, [I tried to] do work exchange or something like that where I could get training for free, because I never wanted to be in a space where I told myself “If I don’t go to class today, I’ll be able to pay this bill.” I didn’t even want it to be a consideration. EG: I came to dance later so you will never see me in a ballet class! Lots of contemporary for me. I am fortunate to be dancing with companies that offer company class. It’s great to dance with my colleagues in a way that is not just about building my technique but also building relationships. I also go to the gym, train and swim to keep in shape. CB: Are there any non-dance or arts related jobs that you are taking on and how do you balance that out with your work and performance opportunities? IH: I write for the paper. That is a visible job but it actually pays very little. I also do freelance editing and I write study guides on literature. KW: It’s only been the last two years that I’ve been able to pay all my bills just freelance dancing. Before that, I taught here in the open program, I worked at the Lines Ballet School administratively, and [did] pretty much all dance-related jobs. CB: One of the benefits of working at the box office or in house management is that you are more likely to see shows, or at least part of shows. Seeing as much as you possibly can and making the time to remain artistically curious and understand what else is going on out there is something that we have talked a lot about these past two weeks. EG: Yes, restaurant jobs might pay more, but I ask myself what is my job at Z space doing for me? It allows me to see shows. What is my job at Counterpulse providing? It allows me to meet artists and to network. At the end of the year, there are so many things that are feeding my work. CB: On the purely artistic side, I’ve seen each of you in several choreographers’ work. I think that is something unique in the Bay Area: we have so many dancers who are performing for several choreographers and the work doesn’t look the same. How do you keep it fresh? Katherine, your work for Robert Moses doesn’t look the same as your work for Amy Seiwert. How do you approach it differently? KW: Staying curious and being open to the person who is in front of you, what they are interested in, trying to stay useful and in the moment [is essential]. If Amy Seiwert gave me a task and Robert gave me a task, even if they were the same tasks, I would never approach them the same way. I’m going to paint more with blue in Amy’s work, and I’m going to paint more with red in Robert’s work. EG: With working with a bunch of different choreographers, you are inevitably exposed to so many different processes. In this one, I am playing a character and I have a 100-page script, with this company it’s super ‘dancy’. In this one, it’s very cerebral, we are writing journals. Then I go to my rehearsal and tell the dancers: ‘let’s use our voice; let’s play with character. Let’s journal for a bit.’ I just can’t help it, it steeps through what I do. IH: I feel like it’s the same way as when you have a conversation with someone. Someone talks a lot louder, and sometimes you talk louder or you get a chance to tell something because of something they said. Even if [Katherine, Eric and I] were talking about the same thing, we would talk about it in a different way. So in the same way, movement is generated in these ways. CB: I’m going to flip the question. I don’t get the sense that you just dance for whomever is going to offer you a job. Why do you look for in a choreographer that you would consider working with? EG: For me, it’s shifting. When I first started getting professional work, I was like: ‘yes I’ll do it!’ I was much more timid when I came out of college. Now, I happen to have a lot of work so I have the option to say: “That is what I am interested in doing and I want to work more in a collaborative setting.” I want to be equal to the choreographer. You are also interviewing that director for that position. Do I want to work for you? KW: I always want to work with someone who is going to provide a framework where I will have room to do my own work, whether that means they are going to tell me what to do but I still bring some of myself, I can feel useful, or the artist is going to just tell me: “go!” Also someone who is going to challenge me and give me space to challenge myself. IH: The part where you are just doing what anyone offers you, that can be a very fruitful experience. How can you make that into an experience that is worth having? CB: What does the 21th century dancer or choreographer need to exist and thrive? IH: It seems that everyone wants someone who can draw on their own archive of experience and be themselves but be many, many faces of themselves. And yet who are the very strong choreographers? They are the ones who have a very unique vision. It is something I think a lot about but I don’t have a resolution for. KW: I learn very early on that the thing that will make you the most employable dancer is not how high your leg can go, what technique you have, but if you are good to work with, if you are a good energy in the room, you are useful. What does that mean is different for different people. EG: Being a dancer is two sided: it’s your creative side and your business side. How do you access your resources? How do you self promote? How to write grants? It’s really important to be savvy and really active in decision-making. Irene Hsiao is a dancer, writer and photographer. She dances with Kinetech, Lenora Lee Dance, and Alma Esperanza Cunningham Movement, and has appeared with Winifred Haun & Dancers, Labayen Dance/SF, Matter Dance, Glory Dance, MC Squared, Urban Pointe Evoc’tion, Jamie Horban, and various other projects in the US and Asia. She writes articles on dance regularly for the SF Weekly’s Exhibitionist Blog and previews for the paper’s Night+Day section. Her book Letter From Taipei was published by Spring Books in 2014. Eric Garcia, Co-Artistic Director of detour dance and the Tiny Dance Film Festival, is a choreographer, performer, filmmaker, teacher, and activist whose feet are deeply rooted in the Bay Area. 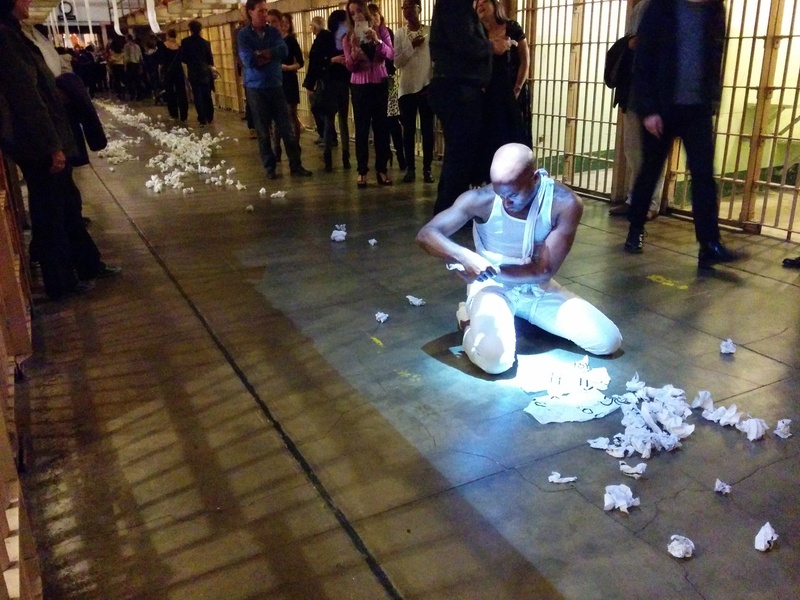 Inspired by personal narrative and storytelling, Eric has collaboratively worked with groups of incarcerated men, senior adults, and self-identified non-dancers on various multi-media and site-specific projects. Since 2010, he has proudly worked as the Production Coordinator with Fresh Meat Productions, a non-profit that produces year-round trans and queer arts programs such as the Fresh Meat Festival, Sean Dorsey Dance, and the San Francisco Transgender Film Festival. 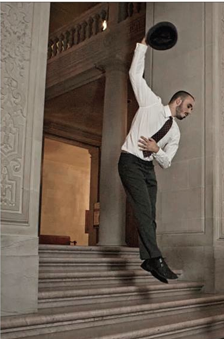 Eric has performed works by Katie Faulkner, Sean Dorsey, Amie Dowling, number 9 dance, EmSpace Dance, Lisa Townsend Company, 13th Floor Dance Theater, Sharp & Fine, FACT/SF, Stephen Pelton Dance Theater, Palanza Dance, The Anata Project, LEVYdance, and Project Thrust. 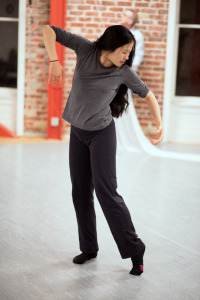 Katherine Wells grew up in Sunnyvale, CA receiving the bulk of her training from Western Ballet School in Mountain View. She has worked with Lucinda Childs, Ann Carlson, Dwight Rhoden, Bliss Kohlmeyer, Todd Eckert, Nol Simonse, Val Caniparoli, Marc Brew, Adam Hougland and been a member of Mark Foehringer Dance Project, Colorado Ballet, Oakland Ballet, Diablo Ballet, Tanya Bello’s Project B, Amy Seiwert’s Imagery, Lar Lubovitch Dance Company, Post:Ballet, Zaccho Dance Theater and Robert Moses’ KIN. Her performance of Moses’ Helen was named Top 10 of 2012 by SF Chronicle. She received an Isadora Duncan Award for her performance of Seiwert’s Devil Ties My Tongue. Katherine recently joined ODC/Dance.